September 07, 2018 at 10:52 am. Philadelphia Eagles coach Doug Pederson refused to confirm or deny a report that quarterback Carson Wentz could remain sidelined for a number of weeks. Wentz’s status has been a hot-button issue for the Eagles as he continues to rehab from a knee injury that ended his season last December during Philadelphia’s march to a Super Bowl title. Backup Nick Foles stepped in when Wentz suffered a torn ACL and LCL in his left knee and played superbly in the team’s championship run, winning MVP honors in the Super Bowl after leading the Eagles to a 41-33 win over the New England Patriots. On Tuesday, Pederson suggested that Wentz is “close” to returning, but the quarterback still has not been cleared for contact by the team’s medical staff. Wentz still has not been cleared for contact by the medical staff after tearing his ACL late last season. Wentz was injured during a Dec. 10 game against the Los Angeles Rams. 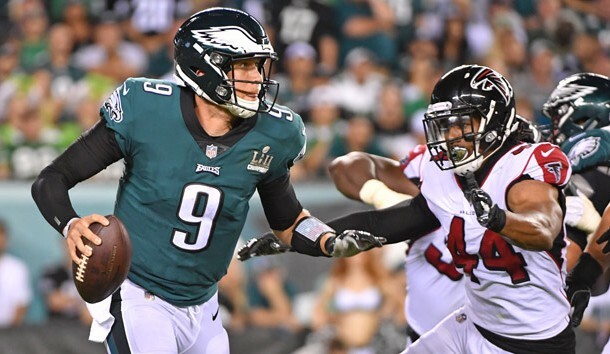 Foles struggled throughout the preseason and labored in Thursday’s matchup against the Falcons, completing 19 of 34 passes for only 117 yards. He also was intercepted, sacked twice and fumbled, although the Eagles recovered. Foles did lead the Eagles on an eight-play, 54-yard winning touchdown drive in the fourth quarter that culminated with running back Jay Ajayi’s second score of the game, an 11-yard run with 2:19 remaining. Philadelphia also did a reprisal of the famous “Philly Special” play from the Super Bowl, when Foles caught a touchdown pass from tight end Trey Burton. The results were not as dramatic this time, but Foles did pick up 15 yards and a first down on a short pass from wide receiver Nelson Agholor. It eventually led to Ajayi’s first TD of the night. The Eagles, who were without injured wide receiver Alshon Jeffery, will have 10 days off before their second game against the Tampa Bay Buccaneers.